Pierogi are one of my favourite Polish comfort foods but I will be honest – making them is time consuming and for this reason I don’t make them too often. This year we had traditional British Christmas dinner with turkey and roasted potatoes rather than 12 Polish dishes on the Xmas Eve but because my mother has already prepared mushroom and sour cabbage filling for pierogi I had no other choice but to make some as well… and I’m glad I did (!) It was actually easier than I remembered from previous years, probably because I had help in a form of my husband with the pasta machine to rolling out even 1,5 mm sheets of dough. I didn’t even use my pierogi maker , only round cookie cutter and then sealed each piróg by hand. It was easier and faster this way, at least for me. Our girls don’t really enjoy this type of pierogi filling, one is scared of mushrooms and the other one does not like sour cabbage. For this reason I had to make separate batch only for them with blueberries instead, recipe coming up next – stay tuned! First soak the wild mushrooms for couple of hours or even better overnight, do not discard the water. Once they are soft, chop them finally and leave aside. In a meantime chop the onions and fry in deep frying pan or a pot, until browned. Add chopped button mushrooms and fry some more. Chop sour cabbage as well and add to the frying pan. Add also chopped wild mushrooms, water from soaking the mushrooms, crushed peppercorns and juniper berries. Reduce fire and cook for about an hour and half, or until all liquid is gone. Season the filling to taste with salt and sugar. Roll out portion of the dough on floured surface with rolling pin to about 1,5 mm thick, you can also use pasta machine with lasagne attachment to help yourself rolling out even sheets of dough. Use about 9 cm in diameter pastry cutter to cut out the circles. To assemble pierogi place as much of the filling as you can in the middle, fold dough in half and seal the edges together with your fingers. Make sure they are sealed properly or they will fall apart during cooking. Leave them aside on floured surface, until you are ready to cook them. When you are ready to cook pierogi bring large pot of water to boil, drop pierogi inside, cook for about 3 minutes from the time they started floating on the surface. Drain and serve immediately refried on butter or topped with melted butter and breadcrumbs. To prepare breadcrumbs in a small saucepan place breadcrumbs and butter – 125 g / ½ bar of butter for ½ cup breadcrumbs, heat on low fire till butter is bubbling, pour over cooked pierogi. Makes about 75 pierogi (allow 5 – 8 per serving). Pierogi taste delicious served with some barszcz. If you are not very good sealing pierogi by hand and don’t have pierogi maker you can use fork to seal the edges, it will work as well. If you serving just small amount of pierogi, you can cook them in frying pan and once water is evaporated add some butter to refry them one time. Uncooked pierogi can be freezed by placing them on floured chopping board inside the freezer. Once they are frozen then can be transferred to the freezer bags and stored for couple of months. They can be later cooked from frozen. If you are looking for more Polish recipes (and DIY ideas), take a look at our Polish section. More pierogi recipes (coming soon). This is traditional Polish recipe plus those are my mother’s pierogi, therefore I’m submitting them to our Inheritance Recipes link-up that we co-host together with Solange of Pebble Soup. 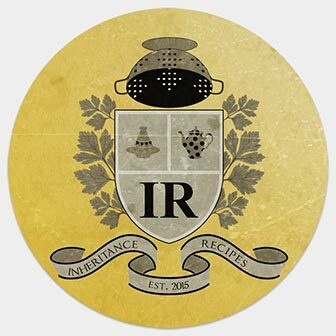 December Inheritance Recipes is hosted on Coffee & Vanilla, please come and join us! Wonderful and they look so perfect. I’m pleased you managed to make a batch. I don’t usually put sour cream into the dough but many recipes do so I will try this next time. Happy New Year!